The vital difference between biomass and fossil fuels is one of time scale. Biomass takes carbon out of the atmosphere while it is growing, and returns it as it is burned. If it is managed on a sustainable basis, biomass is harvested as part of a constantly replenished crop. This is either during woodland or arboriculture management or coppicing or as part of a continuous programme of replanting with the new growth taking up CO2 from the atmosphere at the same time as it is released by combustion of the previous harvest. This maintains a closed carbon cycle with no net increase in atmospheric CO2 levels. 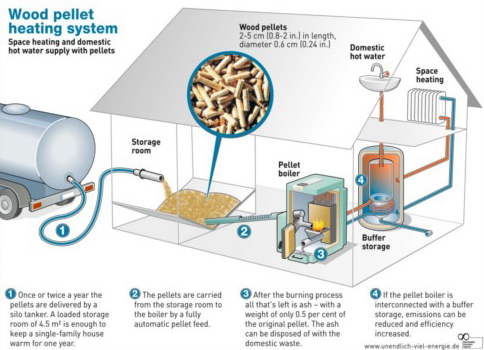 How does a wood pellet boiler work? On start up the auger feeds the wood pellets from the hopper into the burner where it is lit by an ignition element. The burner output is adjusted automatically (modulates) to achieve the set temperature by controlling the feed rate of pellets. The fan in the burner propels hot gas generated from the fuel into the primary heat exchanger. The heat energy is then transferred to water from the central heating system, before being circulated around the house to either radiators and/or underfloor heating. Is a wood pellet boiler eligible for any Grant funding towards the cost? Yes. Currently, up to the end of March 2012, under the Governments Renewable Heat Incentive (RHI) scheme, the installation of an MCS approved biomass boiler, such as the Grant Spira wood pellet boiler, is eligible for an RHI Premium payment (RHIPP). This is a one-off £950 payment towards the cost of the installation and is subject to both the boiler and installer being MCS approved. Installations that meet the RHI criteria will also be eligible for the proposed ongoing payments under the RHI scheme, to start in October 2012, based on the output of the system. Details about how domestic renewable heating system will be supported from October 2012 have not yet been published. However, DECC has announced that "RHI tariff payments will start for homes alongside the Green Deal from 2012 to allow a more whole-house approach to heat production and energy saving". What is the cost saving of using wood pellets compared to oil? The cost of the amount of wood pellets used to heat a property depends on many factors, including the size of the property, how often the occupants are at home, the temperatures required within the rooms, etc. In reality, every home is different and as such, it is difficult to predict the precise cost of the amount of fuel that may be used in a year. However, a comparison can be made between the cost of wood pellets and, for example, heating oil, based on the heat they provide. Any saving from comparing the two fuels, obviously depends on their initial purchase cost. The price of wood pellets is very stable, whilst that of heating oil is the opposite. 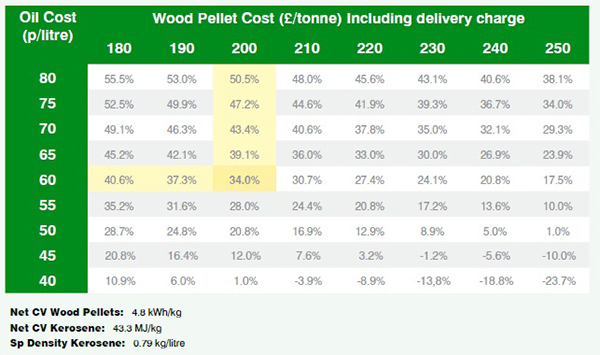 The chart below shows the percentage fuel cost savings for wood pellet against oil. For example, based on an average market price for pellets of £200 per tonne, and heating oil (kerosene) at 60p/litre, the saving per kilowatt hour (kWh) of heat output using wood pellets, is approximately 34%. This assumes that the efficiencies of the wood pellet boiler and oil boiler are the same. If the oil boiler concerned was 10-15 years old (or older), the lower efficiency would result in a much greater saving. We have over 23 years experience operating in the Commercial, Domestic, Agricultural and Leisure sectors, both here in the UK and abroad and have worked hard to build a reputation for excellence, reliability and top class professionalism. With a wealth of experience and expertise we can advise you which are the best technologies that you will be eligible for through feed in tariffs & other payment schemes such as Renewable Heat Incentives the & Green Deal for example. For more information on the products and services we can provide please do not hesitate to get in touch with us and we will be more than happy to discuss all our requirements in full detail.